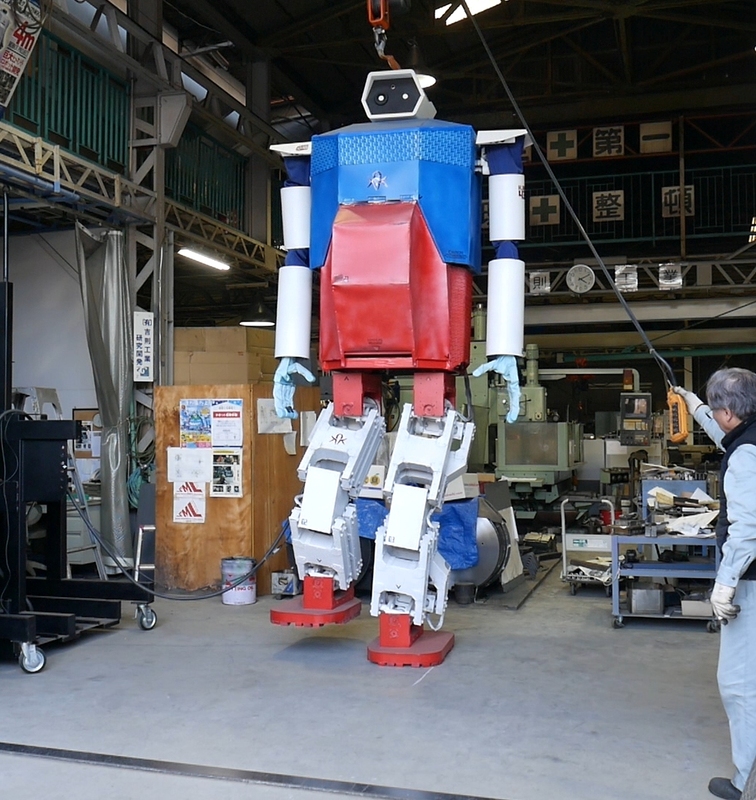 This is a video of the walking of the giant robot. Hajime Research Institute is a humanoid robot development company. We develop robots for research in universities and research department of companies. We develop robots for entertainment in theme parks, amusement parks. The features of the humanoid robot development in Hajime Research Institute are the following. 1) All sizes of humanoid robots from small to huge can be developed. 2) We have technology of humanoid robot development by designing 50 types and 200 bodies or more, and have experiences of robot competition champion, and TV appearances. 3) Manufacturing proffesional factories and we have been developing humanoid robots together more than 10 years. 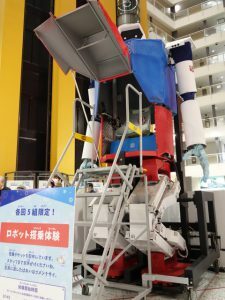 In 2010, we started a project to develop a 13-foot humanoid robot with a built cockpit like a Japanese robot anime “GUNDAM”. It is a challenging goals to develop such a huge biped walking robot in the real world. The pilot opens the hatch of the robot body and rides into the cockpit. The pilot watches the display captured by head camera and operates the robot using the joystick and the master-slave controller. We are looking for sponsors and supporters for our project. We develop and sell humanoid robot “HAJIME ROBOT” series. There are small, middle, large, huge, and wheel type humanoid robots. Universities and research institutes use our humanoid robots, which have wining experience at robot contests, as a platform robot in the field of robotics research or entertainment research. Theme parks, amusement parks, and science event use our huge or wheel type humanoid robot. We also provide design services of humanoid robot from scratch according to customer’s requirements. We accept applications for demonstration of humanoid robots and lectures on robot technology. We give a presentation of two meter tall humanoid robot, an autonomous humanoid robot, which is a winner of the international soccer contest “RoboCup”, and a battle humanoid robot. 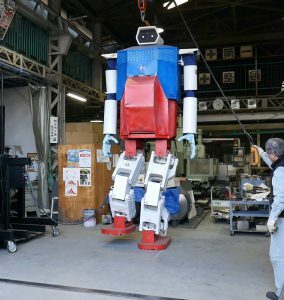 We are preparing a presentation four-meter(13-foot) humanoid robot, which is the tallest biped robot in the world.